Fenton’s Apple Tree is an attractive pattern which was only made in water sets (pitcher and tumbler) plus a few "whimsey" vases that were made from the pitcher mould without the handle being applied. “The only known example of the Marigold over Moonstone Apple Tree surfaced back in the early 1990s. It came out of a collection from the Virginia area. At the time I confess that I was confused about the difference between milk glass and the opaque moonstone colour and sent it to several authors who wrote it up as milk glass. One could not ask for better authentication. Moonstone is a delicate white, translucent (semi-see-through) effect, whereas milk glass is a dense, opaque white that cannot be seen through. 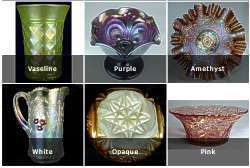 Read more about these and all the other Classic Carnival Glass colours on our website. Click on the image, left - it opens in a new window. ​In the late 1980s and the 1990s, Fenton reissued the Apple Tree pitcher and tumbler in a variety of Contemporary Carnival colours, including pink, blue and (spruce) green shown on the right, as well as red, purple and marigold (which they called "honey"). Except for marigold, the Contemporary colours are different from the Classic Apple Tree items, and the Contemporary pieces are marked with the Fenton oval logo so collectors should have no difficulty in identifying them.